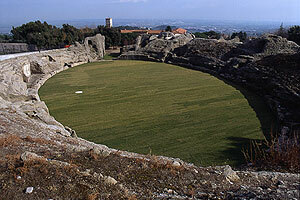 The remains of at least 230 amphitheatres have been found widely scattered around the area of the Roman Empire. 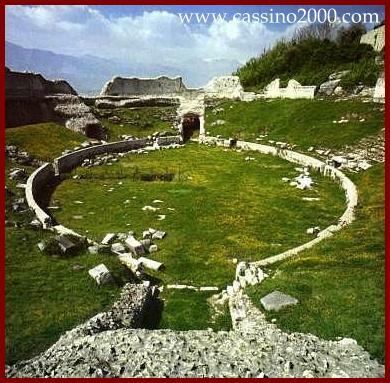 These are large, circular or oval open-air venues with raised 360 degree seating and not to be confused with the more common theatres, which are semicircular structures. There are, however, a number of buildings that have had a combined use as both theatre and amphitheatre, particularly in western Europe. 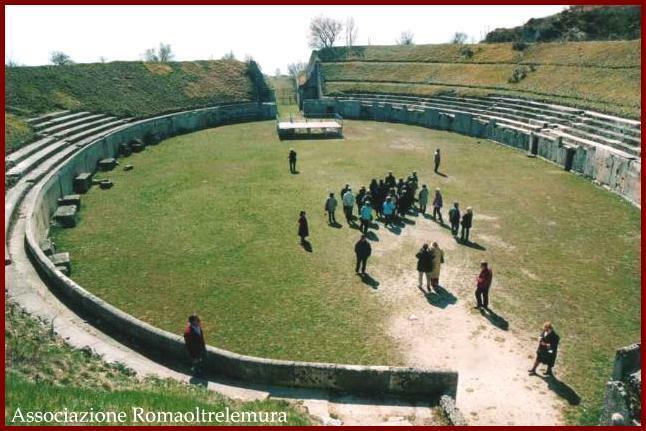 Following is a list of Roman amphitheatre locations by country. Salamis Cyprus 35°11′08″N 33°54′09″E﻿ / ﻿35.185522°N 33.90238°E﻿ / 35.185522; 33.90238﻿ ((Salamis)) Amphitheatre almost vanished. Probably a horse training ground. Viroconium Cornoviorum Wroxeter England 52°40′00″N 2°39′00″W﻿ / ﻿52.666667°N 2.65°W﻿ / 52.666667; -2.65﻿ (Virocorium Cornoviorum (Wroxeter)) No confirmed amphitheatre found at Wroxeter. Speculation as to purpose of cropmark enclosure includes such. Verulamium St Albans England 51°45′14.56″N 0°21′29.88″W﻿ / ﻿51.7540444°N 0.3583000°W﻿ / 51.7540444; -0.3583000﻿ (Verulamium (St Albans)) Theatre that had been used as an amphitheatre; note the almost oval shape. Apta Julia Apt France 43°52′36″N 5°23′51″E﻿ / ﻿43.876569°N 5.397437°E﻿ / 43.876569; 5.397437﻿ (Apta Julia (Apt)) No remains of Amphitheatre located. This is the theatre. Arelate Arles France 1st century AD 43°40′39.92″N 4°37′51.37″E﻿ / ﻿43.6777556°N 4.6309361°E﻿ / 43.6777556; 4.6309361﻿ (Arelate (Arles)) 136x109 Arles Amphitheatre. Still in use today (for Bullfighting, plays, concerts & events). Argentomagus Argenton-sur-Creuse France 46°35′57″N 1°30′35″E﻿ / ﻿46.599061°N 1.509718°E﻿ / 46.599061; 1.509718﻿ (Argentomagus (Argenton-sur-Creuse)) Theatre used also as amphitheatre. 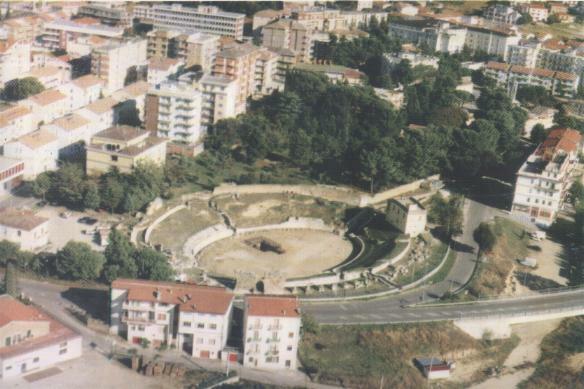 A "half amphitheatre", distinguished from a normal theatre by its oval layout. Juliobona Lillebonne France 49°31′04″N 0°32′12″E﻿ / ﻿49.517815°N 0.536603°E﻿ / 49.517815; 0.536603﻿ (Juliobona (Lillebonne)) A half-amphitheatre. Nemausus Nîmes France 1st century AD 43°50′5.69″N 4°21′34.75″E﻿ / ﻿43.8349139°N 4.3596528°E﻿ / 43.8349139; 4.3596528﻿ (Nemausus (Nimes)) 133x101 Arena of Nîmes. Still in use today (for Bullfighting, plays, concerts & events). Gortyn Gortyn Greece 35°03′29″N 24°57′30″E﻿ / ﻿35.058004°N 24.958405°E﻿ / 35.058004; 24.958405﻿ (Gortyn (Gortyn)) Map of Gortyn, showing amphitheatre This is incorrect. It is a great theatre, long mistaken for an amphitheatre, but clearly D shaped from aerial photos. 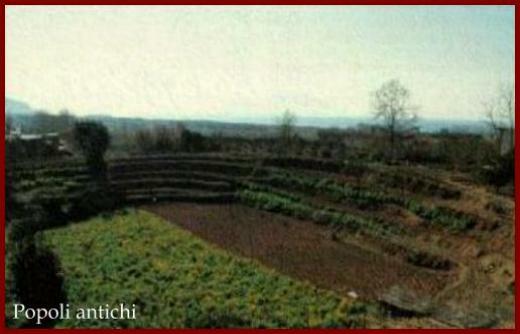 The actual amphitheatre lies under the church in the village of Agioi Deka, built over the arena where the 10 saints were martyred. The shape of the arena can be made out in surrounding buildings. Aquinum Aquino Italy 41°30′N 13°42′E﻿ / ﻿41.5°N 13.7°E﻿ / 41.5; 13.7﻿ (Aquinum (Aquino)) Now completely disappeared, buried beneath the Autostrada. Fidenae Italy A wooden amphitheatre collapsed here in AD 27, killing at least 20,000. 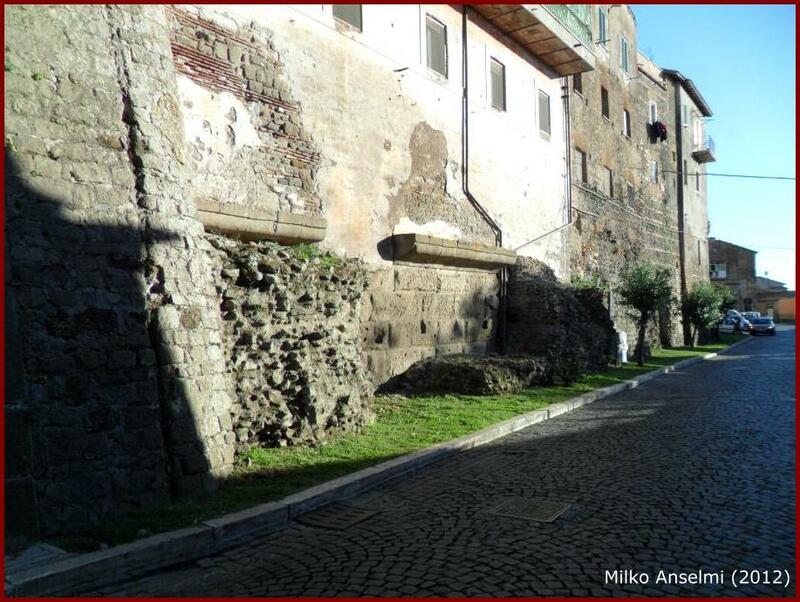 Puteoli Pozzuoli Italy 1st century AD 40°49′33″N 14°07′31″E﻿ / ﻿40.825919°N 14.125313°E﻿ / 40.825919; 14.125313﻿ (Puteoli (Pozzuoli)) 147x117 Flavian Amphitheater; a 2nd minor amphitheater buried beneath the nearby subway line. Roma Rome Italy 1st century AD 41°53′24″N 12°29′42″E﻿ / ﻿41.889882°N 12.494881°E﻿ / 41.889882; 12.494881﻿ (Ludus Magnus) Ludus Magnus, a "training amphitheatre". 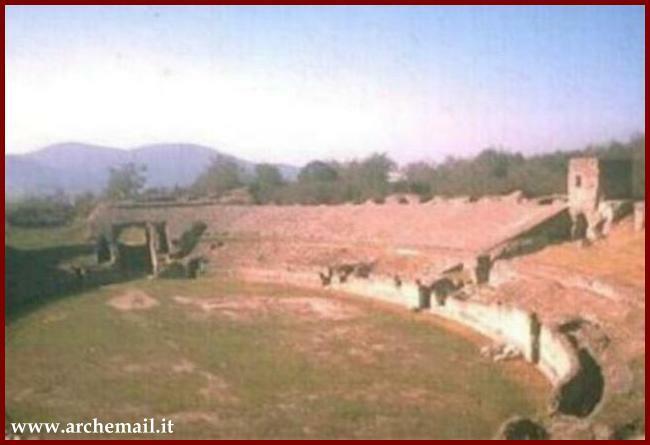 No longer extant are the Amphitheater of Statilius Taurus or the Amphitheater of Nero. Verona Verona Italy 1st century AD 45°26′20″N 10°59′40″E﻿ / ﻿45.439006°N 10.994400°E﻿ / 45.439006; 10.994400﻿ (Verona) Verona Arena is still functional. 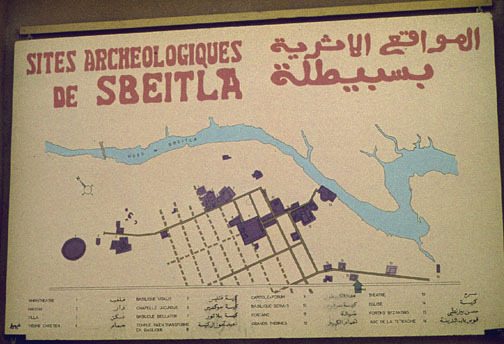 Dura Europos Syria 3rd century AD 34°44′59″N 40°43′44″E﻿ / ﻿34.749855°N 40.728926°E﻿ / 34.749855; 40.728926﻿ (Dura Europos) Small amphitheatre primarily built for the soldiers there. Remains destroyed by ISIS. Thuburbo Minus Tebourba Tunisia 36°49′46″N 9°50′28″E﻿ / ﻿36.829485°N 9.841089°E﻿ / 36.829485; 9.841089﻿ (Thurburbo Minus (Thebourba)) The amphitheatre here was destroyed at the end of the 17th century during the construction of a bridge. Herbermann, Charles, ed. (1913). "Thuburbo Minus" . Catholic Encyclopedia. New York: Robert Appleton Company. Upenna Enfida Tunisia 36°08′02″N 10°22′39″E﻿ / ﻿36.133958°N 10.377445°E﻿ / 36.133958; 10.377445﻿ (Upenna (Enfida)) Nothing now remains of Upenna amphitheatre. ^ R. J. Wilson, La topografia della Catania romana. Problemi e prospettive, in <<CATANIA ANTICA, Atti del Convegno della SISAC>>, Pisa-Roma 1996, pp. 165-167. ^ FASTI On-line. "c.d. 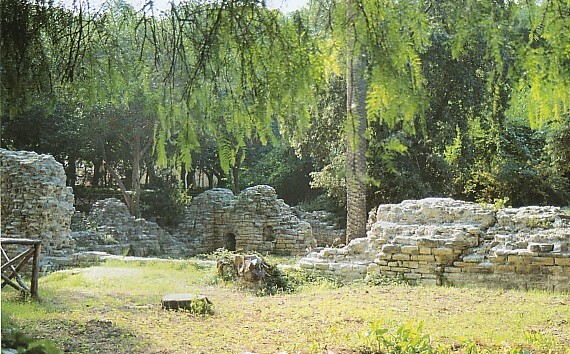 Villa degli Antonin". Retrieved 8 April 2016. ^ "Conjunto Arqueológico de Itálica. Portal de Museos y Conjuntos Arqueológicos y Monumentales de Andalucía". www.juntadeandalucia.es. Retrieved 2016-02-13.